Hikerly — Yosemite backpack: Glen Aulin to May Lake & Mount Hoffman 3 days - 18.6 miles - 4537 ft.
Browse: Home / Yosemite backpack: Glen Aulin, May Lake & Mount Hoffman 3 days – 18.6 miles – 4537 ft. The High Sierra Camps in Yosemite National Park are a much-sought after way to see the park’s mountainous backcountry without the trouble of carrying all your food and gear. An annual lottery is in place for tent cabin accommodations, dinner, breakfast and an optional packed lunch each day for the 7-camp circuit. If you aren’t one of the lucky few to win the camp lottery or can’t really foot the price tag on the luxury experience, you can still do all or part of the route as a backpacker with a Wilderness Permit, pitching your tent in the adjacent backpacker camps and enjoying some amenities like potable water spigots and composting toilets. This particular 3-day route takes you to the two northernmost High Sierra Camps, Glen Aulin and May Lake, with a strenuous day hike up to the top of the 10,860-foot Mount Hoffman before you finish day three. The first day is a fairly easy, mostly downhill walk. 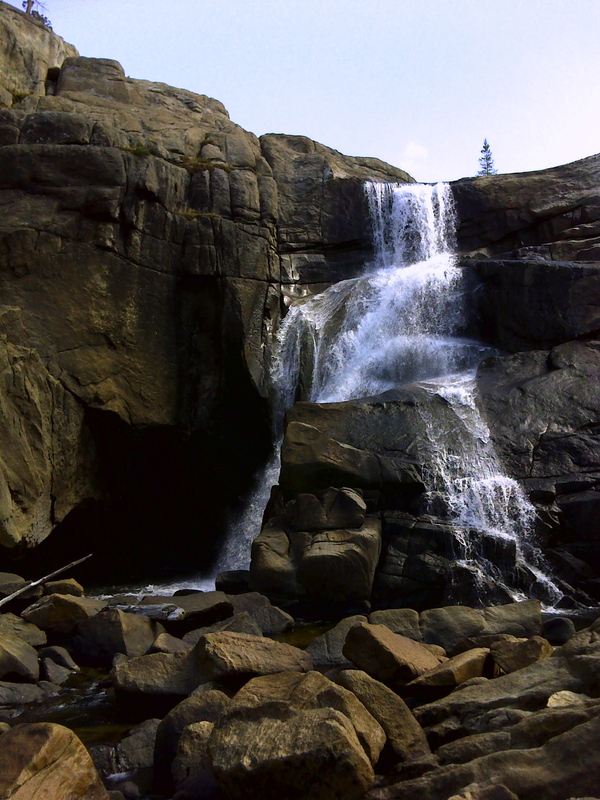 You’ll follow the Tuolumne River for much of the day, passing several waterfalls including the Tuolumne Falls before arriving at Glen Aulin camp along the shores of the White Cascade Falls. The second day is your longest day on this trip with some fairly steady uphill climbs at elevation (and the views to go with it). You’ll start your day around 7,600 feet and you’ll end it above 9,300 feet. Leave your tents behind and bring day-hike gear only for the climb to the top of Mount Hoffman. 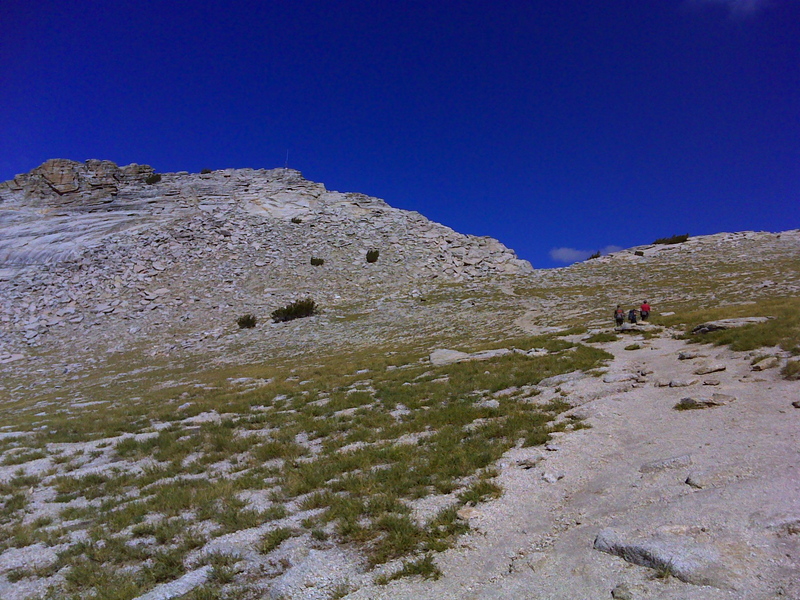 This short trek (less than two miles to the peak) is steep with a boulder scramble to the top. You can pick up your backpacking gear on your way back down the mountain. 1. Just west of Tuolumne Meadows campground on Tioga Road you’ll see a sign to Glen Aulin trailhead down a road on your left. The trailhead is at the very end of the road, past the Lembert Dome day-use parking lot. There are bear bins at the trailhead where you can leave any scented items or food (don’t leave anything with a smell in your car). Note: This is a point-to-point trip so you will want to have a car at the May Lake exit point as well for when you complete your route. 2. The rule of the day will be to follow the well-marked signs for Glen Aulin. You will be hiking on the Pacific Crest Trail for the day, although it is not always marked as such at intersections. 3. There are a few intersections along the route, one early on veers off toward some stables and Lembert Dome, another just beyond it goes to Ragged Peak. At each intersection, keep following the “Glen Aulin” signs. 4. 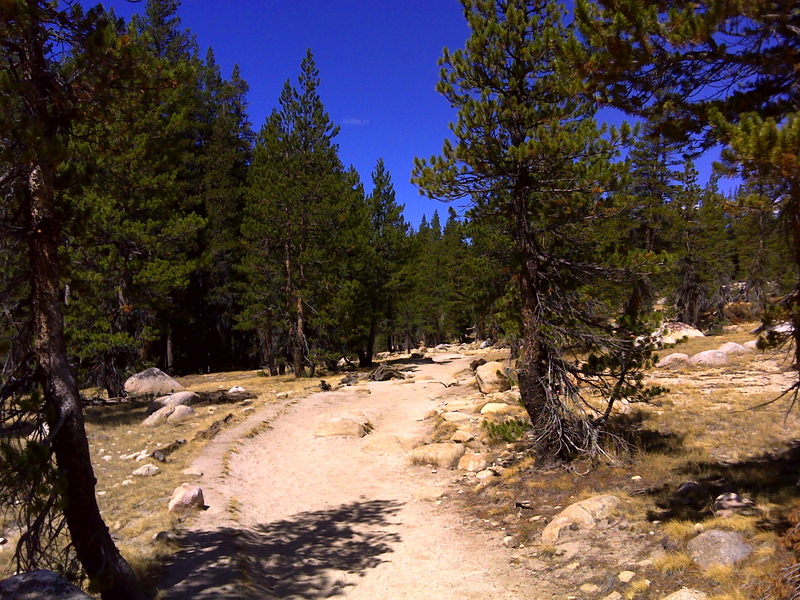 The trail will pass through forested areas eventually coming close to the Tuolumne River after passing a gorgeous view of a meadow. You will have to cross a somewhat smooth rocky expanse near your first encounter with the river. Just follow the rock cairns to find yourself back on the dirt trail on the other side. 5. 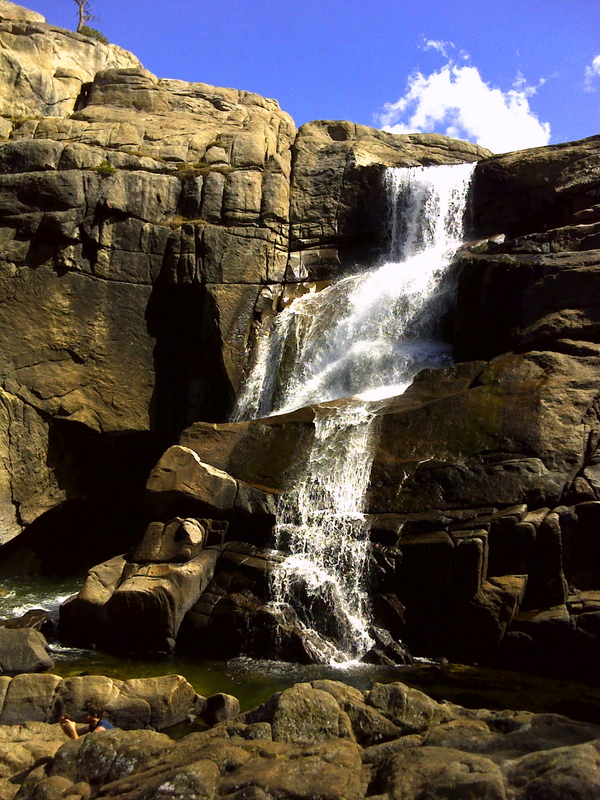 As you get closer to Glen Aulin you’ll be treated with several waterfalls, the biggest of which is Tuolumne Falls. It’s a good spot to stop and take in the view. 6. Just before the final descent to Glen Aulin, you will pass the intersection for May Lake. Take note of this spot as you will backtrack to it tomorrow to continue on Day 2 of your trip. 7. Glen Aulin camp is just across a footbridge next to the White Cascade waterfalls, a great place to cool your feet after the day’s hike. You can also walk just up and over the ridge following the signs for Waterwheel Falls (for about .1 miles) for a stellar view to the northeast of the Grand Canyon of Yosemite. 1. 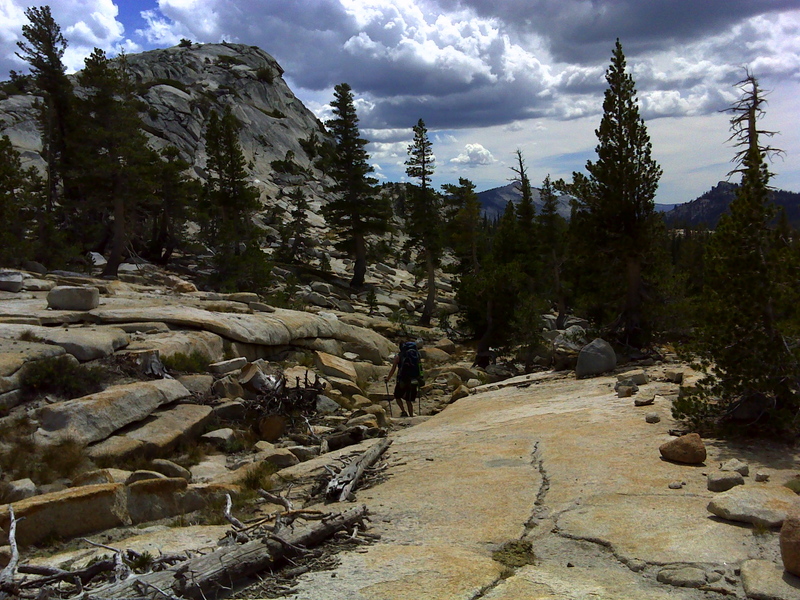 Backtrack from Glen Aulin in the direction you came from yesterday to the intersection for May Lake. 2. 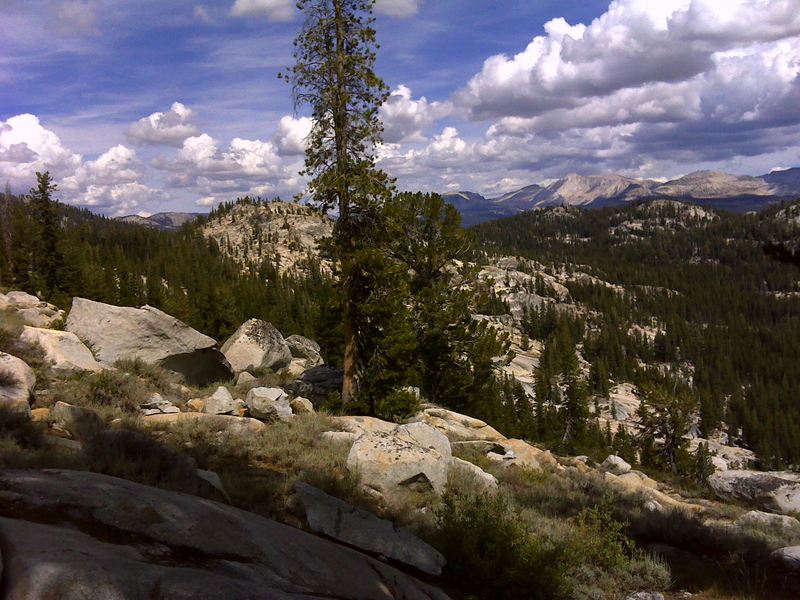 After about 4 miles you will come to an intersection to the left to go to Tenaya Lake and Tioga Road. Continue following signs to May Lake. 3. In .4 miles you’ll come to the intersection for Ten Lakes Pass. Continue following the May Lake signage. 4. You will continue to climb in elevation from here, eventually coming to some switchbacks on a stony expanse taking you up and over a ridge. Don’t get your hopes too high yet – you aren’t done climbing just yet. 5. Your highest point of the day will be as you pass through a meadow very close to May Lake. From this meadow you will descend ever so slightly to come to the shores of May Lake where your camp will be. You can swim in the lake to cool off if you want (it is quite chilly, especially early in the season when there is snowmelt). If you continue around the lake’s southern shore, past the backpacking campsites, there is a rocky outcropping where people often dive into the lake (jump at your own risk). 1. Today will start off as a day hike to the peak of Mount Hoffman (that double peak you see shadowing May Lake), so you can leave your tent and cookware right where they are in the backpacker camp and just bring your day pack needs. The trail to Mount Hoffman is completely unmarked, but well-enough traveled to be fairly easy to follow when the ground is snow-free. 2. To find the trail simply follow the path next to May Lake as it wraps around the southern edge of the lake, just beyond the backpacker camp sites. This path will continue heading up and toward the looming Mount Hoffman peaks just in front of you. 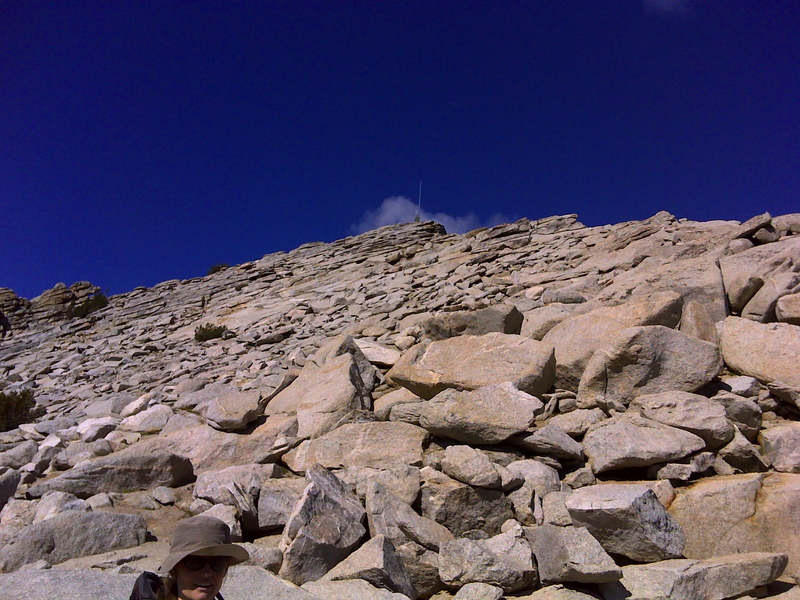 Keep your eyes out for the well worn path and any rock cairns that mark the way. 3. 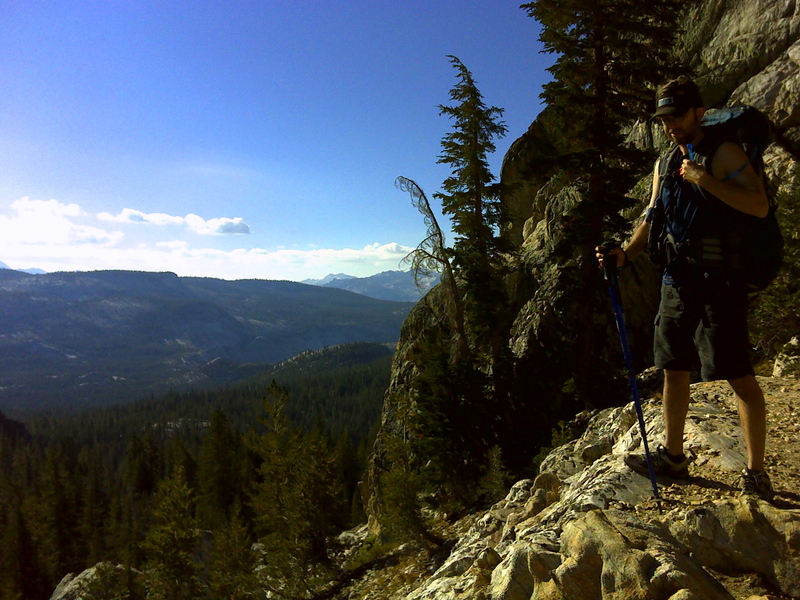 The overall trip to the top of Hoffman is less than 2 miles from May Lake, but it is a grueling 1,500+ foot climb. You’ll pass through meadows, follow switchbacks up a rocky expanse and cross a grassy expanse with potential marmot sightings before reaching the toughest part of the day: a 400-foot scramble up boulders to the peak (of the two peaks in front of you, the one on your left is the 10,860 foot summit). This scramble isn’t easy and for those of us with shorter legs may require a little teamwork to help you up some of the larger ones, but the view is worth the struggle. 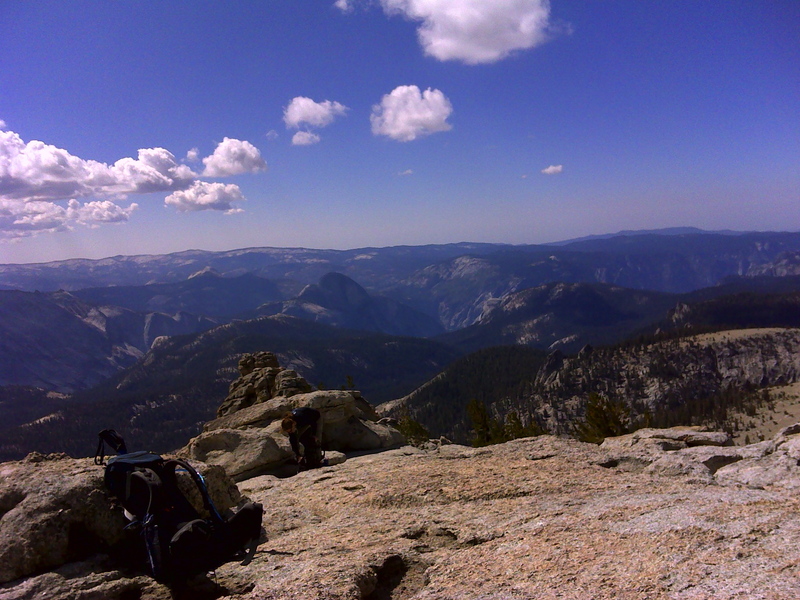 You’ll feel like you are on top of the world as you peer down on Half Dome a couple thousand feet beneath you. 4. 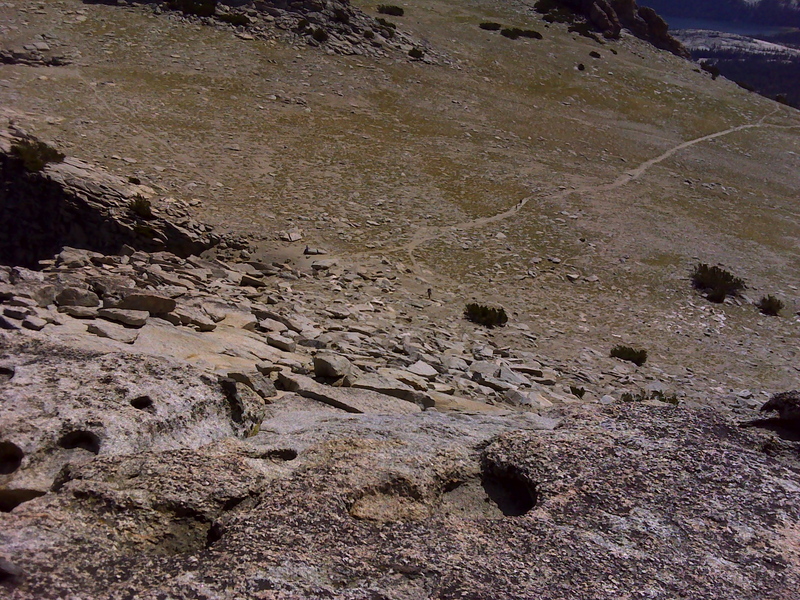 After you’ve taken in the summit (please don’t feed the marmots! 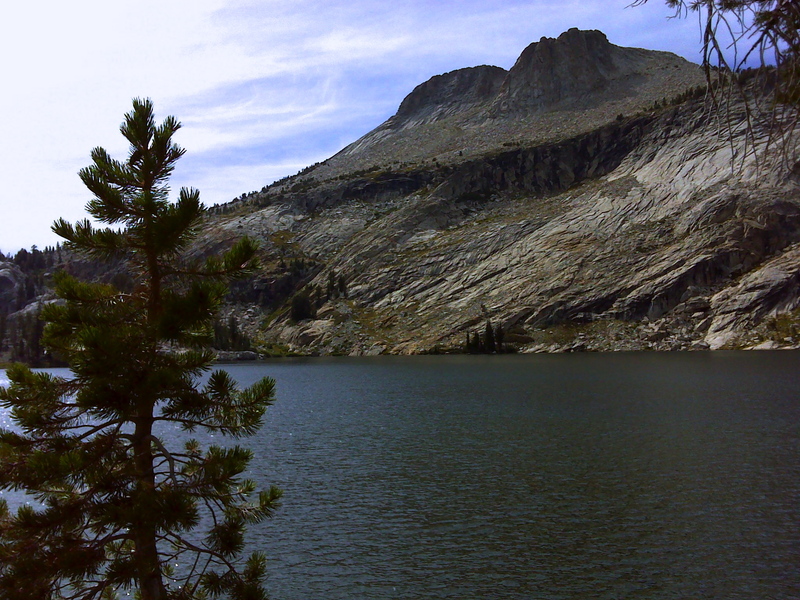 ), you will descend back down to May Lake to gather up all your backpacking gear. 5. You’ll catch your trail to the May Lake exit point near the backpacker bathrooms and bear bins. Take a right on the trail so you are heading south and follow it to the May Lake parking lot. 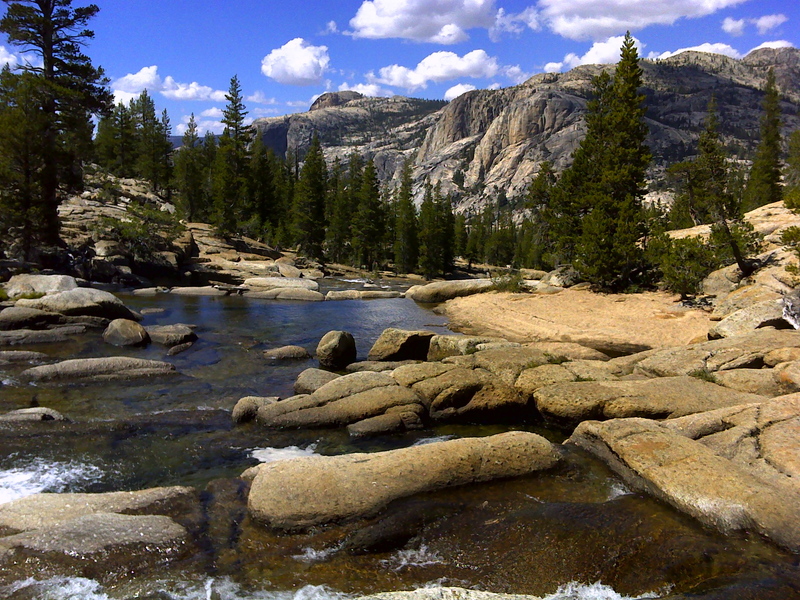 To backpack in Yosemite’s backcountry, you need to get a Wilderness Permit. 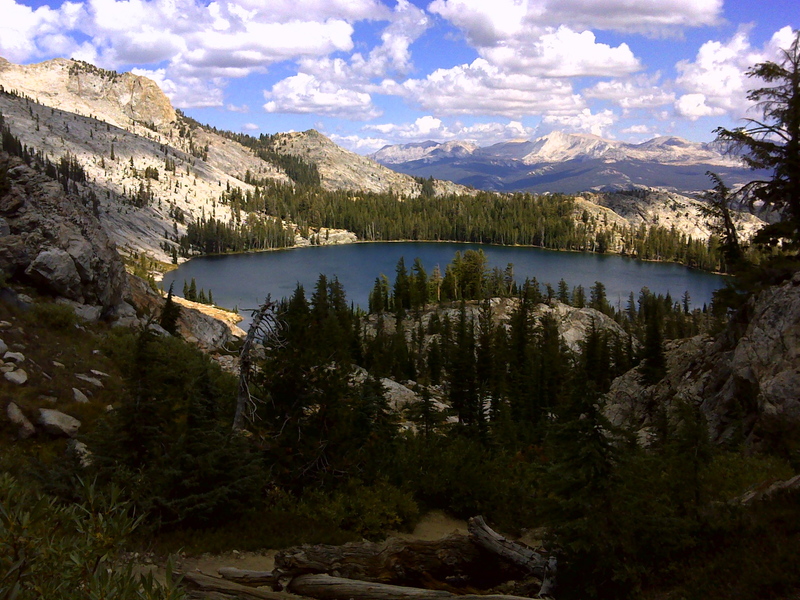 Permits are issued based on your entrance and exit trailheads, so in the case of this hike you would need a permit for Glen Aulin to May Lake. You can get a permit up to 24 weeks in advance of the date of your departure and they cost $5 per confirmed reservation plus $5 per person. There are a limited number of permits available, so best to plan ahead. Upon arrival to Yosemite, you will need to stop by a wilderness permit station in Yosemite with your reservation to pick up your official permit. There is one in Tuolumne Meadows which would be most convenient to your trail start, or you can go to the one in the valley. Your permit will also allow you to camp in the backpacker campground at Tuolumne Meadows one night before your entrance day and the night of your exit day. The cost to stay at that campground is $5 per person paid via an envelope at the campground. While you can park temporarily in Tuolumne Meadows Campground to unload your stuff, you will need to park your car(s) at the Glen Aulin and/or May Lake trailheads overnight. 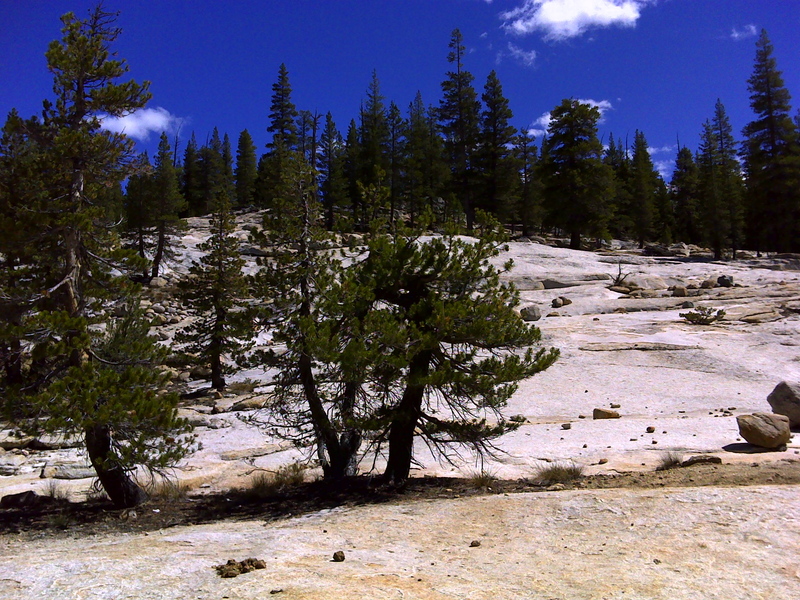 Glen Aulin trailhead is walkable from the campground while May Lake is not. Learn more about Wilderness Permits and how to make your reservations here. This is a point-to-point trip which means you will need to shuttle cars so you have a car at your exit point. The May Lake parking lot is off Tioga Road, west of Tenaya Lake. 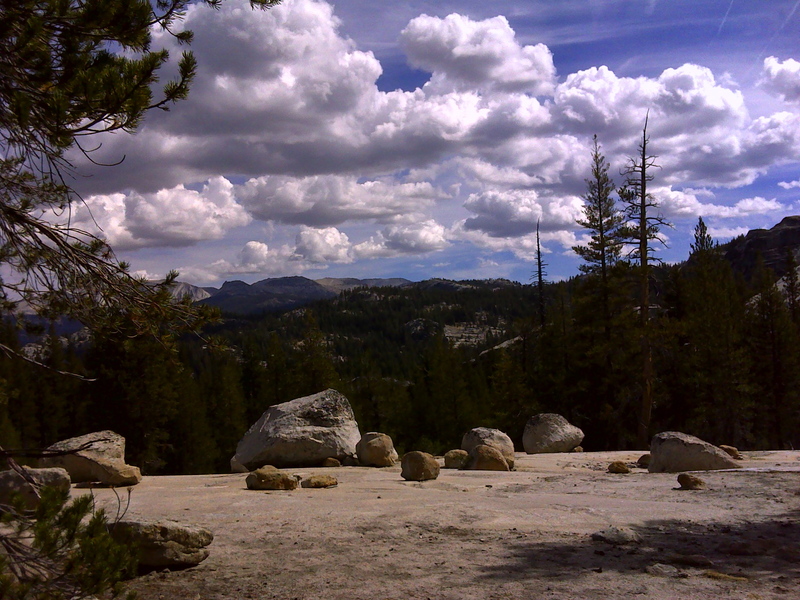 The parking for Glen Aulin trailhead is just east of Tuolumne Meadows campground. Because your first day is an easy, short day, it is reasonable to shuttle the cars in the morning before you start your trip. Plan on about an hour to drive from Tuolumne Meadows campground (assuming you spent the night there) to May Lake to drop off one car and drive back in another to the Glen Aulin trailhead. Bears are no joke in Yosemite. Be sure to follow all of the rules about bear and food storage while backpacking. While this hike does go to established camps with bear bins available, I would encourage you to carry a bear canister anyway. The bins are not rodent proof and with the concerns about hantavirus, keeping your food sealed away from both bears and rodents is important. I had to throw away a toothbrush on a recent trip that was gnawed by a rodent in a bear bin at Glen Aulin and another member of my group lost some trail mix. So put the food in a bear canister and the canister in the bear bin at each of the camps. If you don’t have a bear canister you can rent one for $5 at the same wilderness permit station where you pick up your permit. Also, don’t leave anything tasty in your cars while you are in the backcountry. There are bear bins at both the entrance and exit trailheads for anything you might not be taking with you on the trail. In addition to scented items, a ranger recently told us that the bears have learned to recognize based on site coolers and bear canisters, so even if they are empty, don’t leave these items within line of sight in a vehicle. Don’t believe all the bear concerns? Here’s a cautionary tale. On a recent visit to Yosemite, some fellow backpackers showed up to Tuolumne Meadows backpacker campground shortly after midnight. After unloading the car, one of them went to move it to its final parking space while the others started putting up the tents. The backpack for the driver of the car was sitting several feet from the group, open, but not yet emptied of its food contents. A very brazen bear walked up and took the ENTIRE pack and dragged it into the woods to dig through it for the food. Making noise disturbed the other campers, but not the bear. Only after throwing rocks toward the bear were they able to recover the backpack, but all the food was lost. Thankfully, they were close to Tuolumne Meadows and were able to restock the food before heading out into the wilderness and the pack and gear were not damaged since they were left open making it easy for the bear to grab what he really wanted. If you have any incident or encounter with a bear or see one involving others, be sure to file a bear incident report with the wilderness permit office to assist the folks handling bear management in Yosemite. There are established fire circles at both Glen Aulin and May Lake backpacker campgrounds where you can generally build a fire at night. When you pick up your wilderness permit, you should verify with the ranger that there are not restrictions on such fires at the time of your trip. By all posted rules, you need to reserve in advance (and pay extra) if you want to get in on the prepared meals at the High Sierra Camps. However, we had mixed results asking at the camps themselves when we arrived in person. Glen Aulin said they had enough food and space for our group if we were interested and we could pay at the camp; May Lake had no room available. Similarly you can ask about packed lunches the day before you want them at the camps, but you can’t count on anything without a reservation. If you happened to forget your headlamp or left your favorite trail mix on the counter at home, Tuolumne Meadows Store just west of the Tuolumne Meadows campground has just about everything you could need from camp gear to backpacking food. It’s your best bet nearby for any last minute needs. If you took advantage of the permit access to Tuolumne Meadows Campground the night before your wilderness excursion, you can get your last big breakfast just down the street at the Tuolumne Meadows Grill (next door to the Tuolumne Meadows Store). They have amazingly tasty buckwheat pancakes as well as egg and cheese (with or without meat) breakfast sandwiches. They even serve a great cup of Peet’s Coffee. 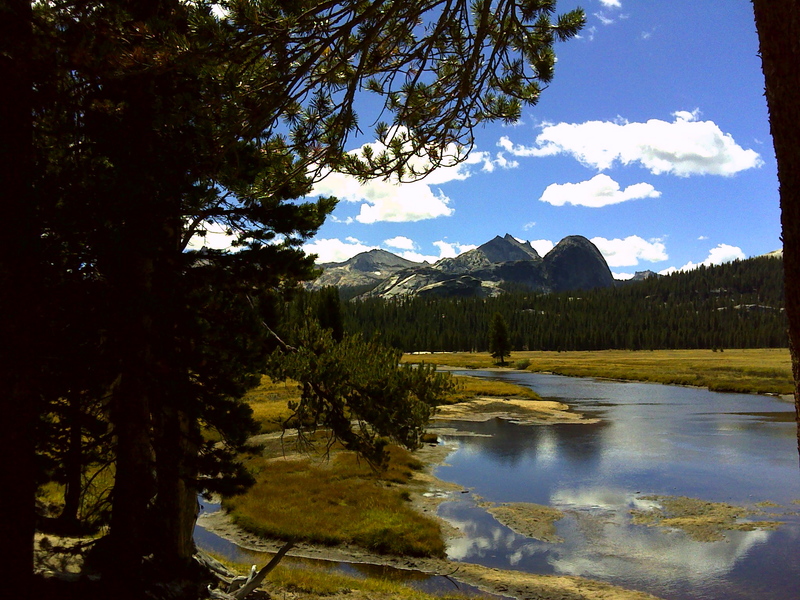 Once in Yosemite, follow the signs to Tuolumne Meadows on Highway 120. 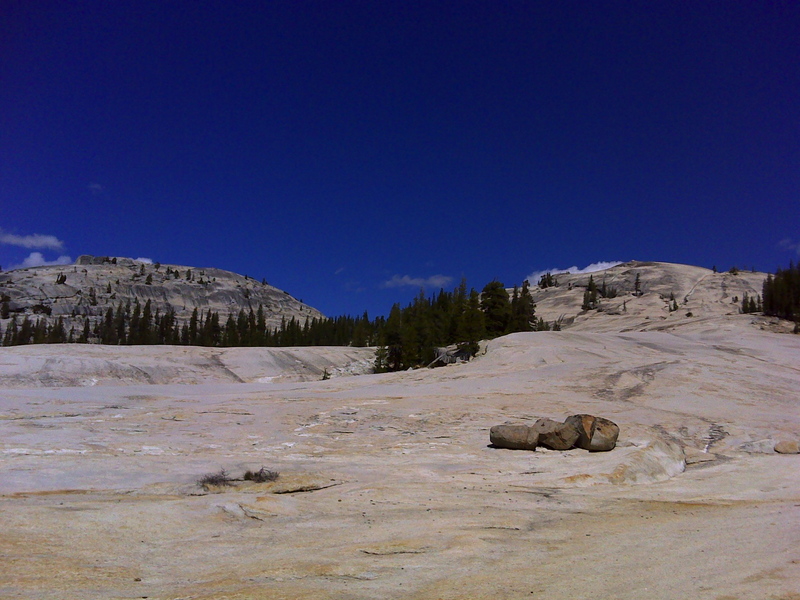 May Lake trailhead is just west of Tenaya Lake while Glen Aulin is just east of the Tuolumne Meadows campground. You’ll want to do a car shuffle so that you have a vehicle at your exit point. 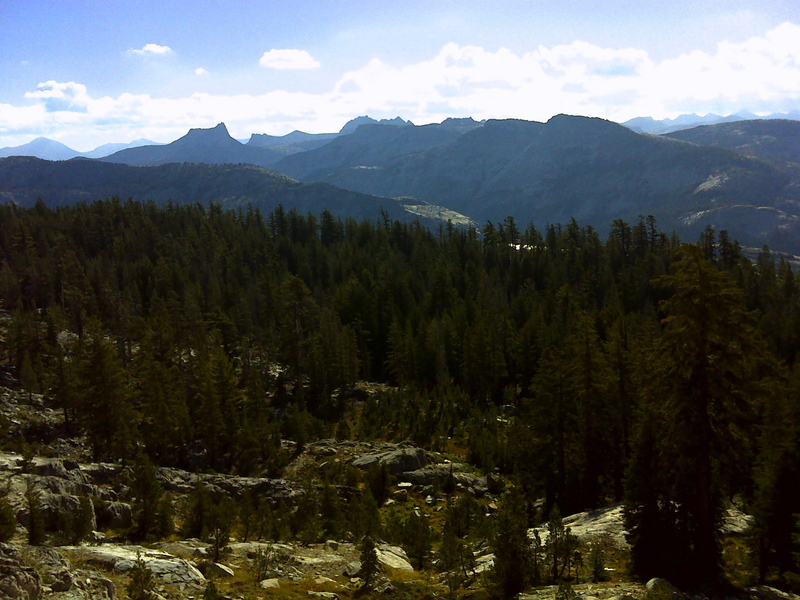 Continue to Tuolumne Meadows area. Thanks for sharing the trip. Now I have something else to add to my bucket list. Johanna, Thanks for this amazingly detailed account. We have a small group of six doing the whole loop in July 2013 and will share this with everyone. Enjoy your trip! Are you staying in the tent cabins or camping? We got lucky and will be in the tent cabins. As we are all over 49 and in various levels of fitness, we thought this would be the best way to see the High Sierras and make it back in one piece. Only a few weeks out now and very excited. This is a great write up. We just did this hike, and is was exactly as described. The only thing I would correct is that there IS a free shuttle bus around Tuloumne, that can take you from the ranger station the May Lake entrance on Tioga road, so you don’t need two cars. Hey Marco – thanks for the tip. I’ll update the blog to add that tidbit this week. Great info! Hi All…I have a question I’m hoping someone can answer. I’m planning a trip in June 2016 to hike this trail. Is it feasible to go from the Glen Aulin trailhead at TM to May Lake in one day? Was hoping to camp at May Lake 1st night, Little Yosemite Valley the 2nd night, and hike out to Yosemite Valley the morning of the third day? Any thoughts? Depends on your fitness level. Distance wise it’s ~14 miles, but keep in mind, you are at elevation and there are strenuous ups and downs. Also bear in mind if you are backpacking you will move slower than you would on a day hike with the pack. Someone who has been on the John Muir Trail for weeks will be able to do 14 miles in a day on similar terrain/elevaion once they’ve been on the trail for a bit to get acclimated, but if you are just driving up to elevation and starting from Glen Aulin without much previous experience in the terrain and elevation, I would not recommend trying to do it all in one day. Ultimately: It’s comes down to personal pace, fitness and the experience you want to have. Something worth noting as a personal benchmark for me: If I’m day hiking in the bay area, averaging 2.5 miles an hour is pretty doable. If I’m backpacking in the Sierras and just starting a trek, 1-1.5 miles an hour is my starting point. I agree with everything Johanna says. Also consider that there are long stretches where you are completely exposed with no tree cover. Can make for a hot day. Why rush through? If you’re pressed for time, Start at the May Lake parking lot. Thanks for the help with everything! Can anyone give me a good breakdown of what the trail is like from Glen Aulin > May Lake > Yosemite Valley? Can we camp anywhere on the trail? I have permits for 3 days and dont want to camp anywhere it might be prohibited? 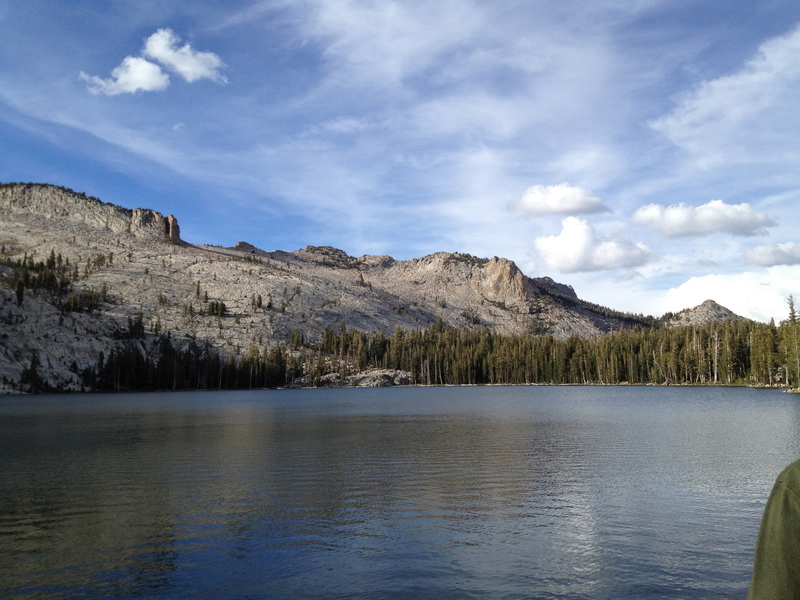 If you have the Wilderness Pass for those specific destinations, that usually means you can stay in the backpacking campsites at Glen Aulin and May Lake. The permit may or may not include Little Yosemite camping area. 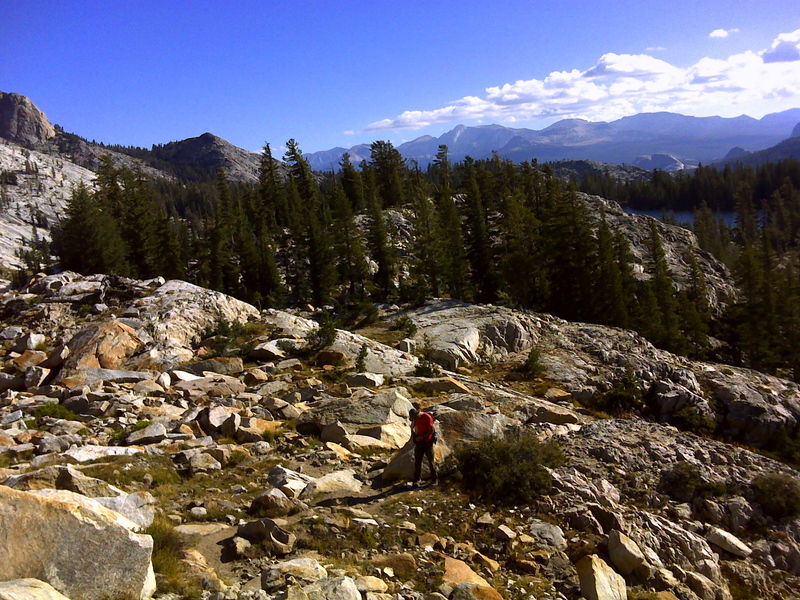 Which route/trail are you taking down to the valley after you cross Tioga Pass road from May Lake? 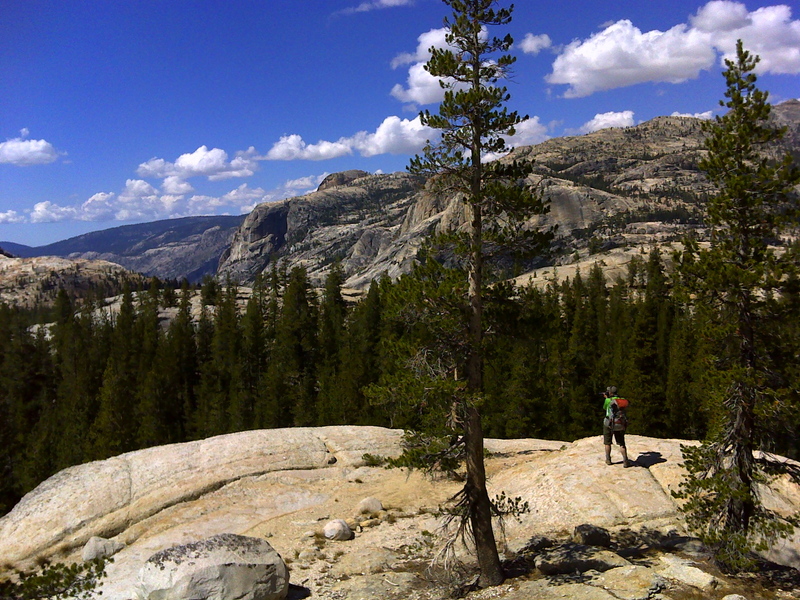 There’s usually a no-camping zone a few miles around Tuolumne Meadows (check with the rangers for the exact radius/zone) but beyond that you should be able to find backcountry spots near Clouds Rest, Little Yosemite camping area and other off trail spots. Just remember never to camp on vegetation – look for areas that appear to have been used before in the woods away from the trail and at least 100 feet from any water sources. When you pick up your Wilderness Permit, the rangers are usually really good at providing info on what’s a good area for your time of year and current conditions, so hit them up for more specific ideas.